Allow me to clarify: I love motorcycle rallies. The bikes, the gear, the spokesmodels, the swag — it’s Mecca for a gearhead, and I always bust through the gates agape, ready to be entertained for days. And then, reality sets in. Different town, different rally, same deja-vu. Shopping is part of the Americade experience for many people at the rally. Photo by Matt Kopec. Happens every time. After one walk-through, it all starts to look and sound the same and it feels as if I’ve been here before. It’s not long before the noise drowns out the appeal and I begin to resent everything around me — the traffic, the crowd, the heat, the lousy food and bad beer at exorbitant prices. After covering motorcycle events for years, I’ve learned the only way to find the unique in a bike rally is to remind myself that the joy of motorcycling lies in discovery, of going somewhere I’ve never been and seeing things I’ve never seen. So to get to the heart of any rally, I get on my bike, and I ride. Americade draws huge crowds. When being part of the crowd stops being fun, there's more to do. Photo by Alfonse Palaima. 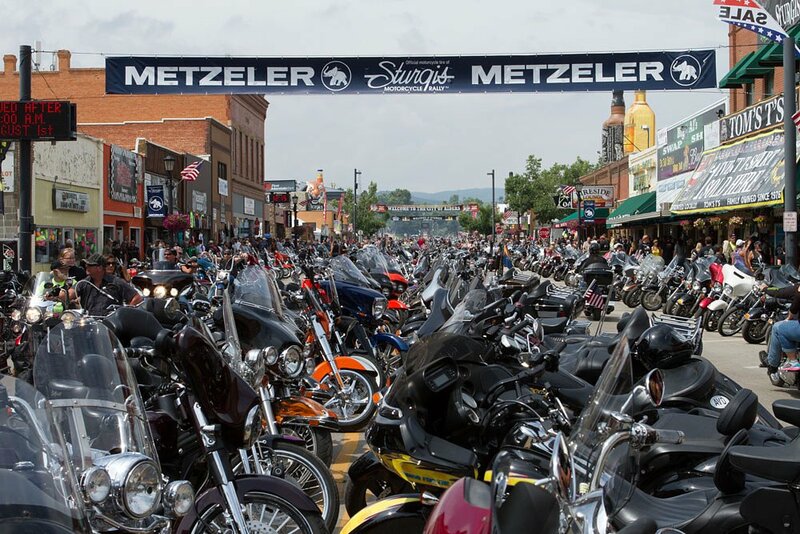 One of the largest motorcycle rallies in the United States, Americade attracts tens of thousands of bikes and riders of all styles and persuasions to the family-friendly town of Lake George, N.Y., each June for a week-long celebration of life on two wheels. It’s a comparatively tame rally, Americade. You won’t find burnout pits, life-saving exhaust pipes, or coleslaw wrestling here. Americade is not about booze, babes, and braggadocio. Rather, the emphasis is squarely on motorcycling — on touring, sport-touring, and cruising, in particular — with daily guided and self-guided mini-tours, demo fleets from all the major manufacturers, and one of the largest moto-swaps in the Northeast. At Americade, it’s all about the ride. Americade draws thousands of riders to the shores of Lake George every summer. Photo by Matt Kopec. Despite these efforts to distinguish itself from the moto-rally pack, though, the fact is, Americade has (for the most part) the same stuff the other rallies have. And there’s an entire population of motorcyclists for whom “family-friendly” saps the appeal of any bike rally. Even worse (for riders such as yours truly), a guided mini-tour with 20 or more bikes sounds like nothing short of a guided ride to hell. So Americade isn’t for everyone, and that’s okay. Luckily for those of us with a love/hate relationship with bike rallies, upstate New York has a lot to offer motorcyclists beyond Americade. Americade made its reputation on being inclusive: all brands, all bikes, all riders welcome. Despite this spirit of community, the bulk of Americade activities are much like the two-laners that lace the Adirondacks — more conducive to touring and cruising. Wanting to give ADV riders a reason to come to the area, Americade’s organizers this year announced the inaugural Dirt Daze Adventure Bike Rally, happening concurrently in Lake Luzerne. There's now a home for adventure bikes during Americade. Dirt Daze photo. Dirt Daze offers dirt mini-tours through the Adirondacks and Green Mountains, and rider training from notable pros such as Jimmy Lewis and Mike Lafferty. KTM, Ducati, and Zero will host on-site demo rides, and Honda is debuting its much-anticipated Africa Twin at DirtDaze. All registered Dirt Daze attendees also get access to Americade’s vendor village in Lake George, as well as the factory demo area. Registration for DirtDaze is nearing capacity and many rides are already sold out, so hurry. Just off the New York Thruway in Newburgh, N.Y., the Motorcyclepedia Motorcycle Museum is right on the way to Americade for most riders heading to the rally. Motorcyclepedia photo. Just off I-87 in sleepy Newburgh, N.Y., sits possibly the most expansive collection of classic motorcycles in the Northeast. It’s definitely one of the coolest. Motorcyclepedia features more than 500 bikes, including dozens of vintage Harleys and Indians but also oddities and rarities from Excelsior, Thor, Pope, and even Flying Merkel. There’s a phenomenal police and military bike exhibit, a fine collection of famous motorcycles from movies and TV shows, and with over 85,000 square feet of exhibition space it’s got room for not one but two complete vintage motordromes (“Walls of Death”) on its lower floor. Vintage enthusiasts headed to (or from) Americade from points south, such as Philadelphia, Long Island, or New York City would be remiss not take a few hours out of their trip for a ride through time at Motorcyclepedia. It’s only 11 bucks to get in, but there is a caveat: Motorcyclepedia is only open Friday through Sunday, 10 a.m. to 5 p.m.
It’s the perfect day trip from Americade. Ever wanted to see Mickey Mantle’s glove? Jackie Robinson’s cap? Curt Schilling’s bloody sock? How about uniforms from DiMaggio, Cobb, and Gehrig? Babe freakin’ Ruth? The National Baseball Hall of Fame and Museum in Cooperstown is a wondrous, historic place filled with wistful, smiling faces and enough memories to fill a, uh, museum. Happen to like both bikes and baseball? The Baseball Hall of Fame is a natural day trip from Americade. Hall of Fame photo by Milo Stewart Jr.
Only about a hundred miles southwest of Lake George, any self-respecting motorcyclist should be able to make the ride in about two hours — and any self-respecting baseball fan should never forgive himself to being that close to greatness and not stopping to pay his respects to America’s Pastime. The Hall of Fame is open seven days a week, from 9 a.m. to 9 p.m. (in summer). You’ll need a few hours to take it all in, but Cooperstown itself is a slice of small-town Americana, its quaint downtown lined with shops, restaurants, and other curiosities. So check out the Hall, get a hand stamp, go have lunch and finish the tour later. You can still be back in Lake George long before the sun goes down. It’s not cheap. Admission for adults is $23 and for seniors, it’s $15. But here’s a pro tip: many downtown Cooperstown businesses offer discount coupons for museum admission. Ask around. What goes better together than motorcycles and rock n’ roll? If you’re riding to Americade from the south or east, consider a pit stop in the Catskills to check out Mountain Jam, an annual outdoor concert festival taking place the weekend before Americade. Curated by Allman Brothers guitarist Warren Haynes, this year’s lineup features Haynes’ band Gov’t Mule along with Wilco, Beck, Avett Brothers, Jason Isbell, Gary Clark Jr., Umphrey’s McGee, Courtney Barnett, and more than 40 others. Held at the Hunter Mountain Ski Resort near the famed music town of Woodstock, watch the acts from the bunny slope while the ski lifts carry revelers and mountain bikers overhead. Performances begin in the early afternoon and run well past midnight, and with thousands of revelers camping on-site, the party usually continues long after the performances stop. So if you plan to go, you should probably reserve a campsite. . There's some good riding to be found in the Adirondacks. Photo by Alfonse Palaima. The largest natural protected area in the lower 48, Adirondack Park stretches from the Vermont border more than halfway across the state to the west — nearly to Lake Ontario. With six million acres of wilderness, thousands of miles of hiking trails and more than 100 small towns and villages to explore, you’d have to put in some pretty serious effort to get bored here. From Revolutionary War battlefields to craft breweries, cideries, and wineries, from waterfall hikes to antique shops, the park has something for everyone. 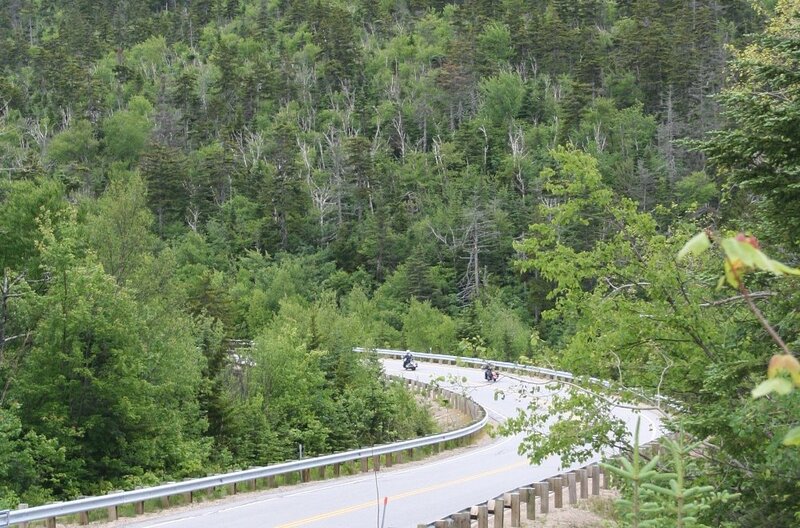 And getting around by motorcycle is at least half the fun, because the riding is scenic and spectacular. Any Adirondacks excursion should start with a visit to www.GoTourNY.com, the official motorcycle touring website of upstate New York. With a calendar of motorcycle events, lists of local repair shops, links to motorcycle-friendly lodging, and much more, it’s chock full of info. The site’s most useful feature, though, is its 16 downloadable tank maps with highlighted routes for each region of the park, providing the guideposts for laid-back day rides, challenging canyon carving, or full-blown tours with suggestions for off-bike activities like museum-hopping, wine tasting, outdoor adventure expeditions, etc. And there’s so much more, from historic Fort Ticonderoga to works by old-world masters like Picasso and Renoir at the Hyde Collection Art Museum, to thrills at Six Flags Great Escape if you want a different kind of ride. Heck, the Ben & Jerry’s factory in Stowe, Vt., is just a couple hours away. So if you start feeling bogged down by hawking vendors, traffic jams, and crowds, give your throttle a twist and see the rest of upstate New York.